Indeed, as Isaiah 19 states, the Great Pyramid is a marvelous stone witness to the Lord. 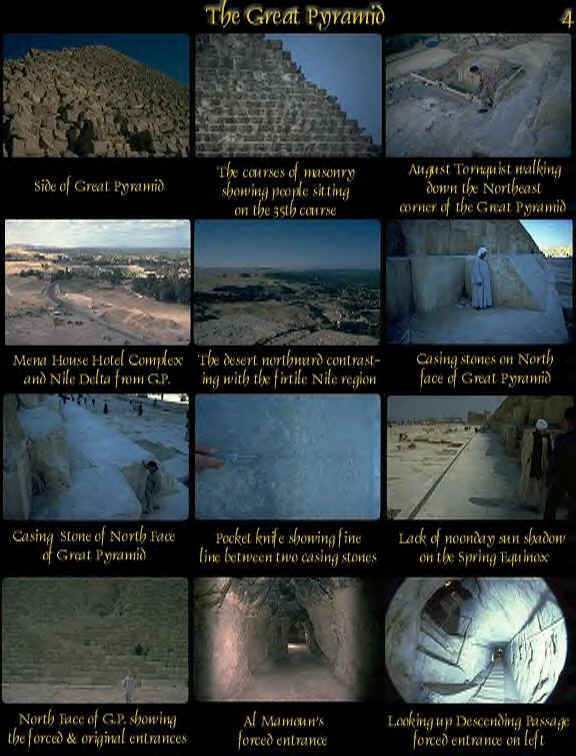 The striking religious symbolism of the Great Pyramid and it’s amazing corroborations of Bible prophecy and chronology have prompted the name "The Bible in Stone." The following chart will illustrate this corroborative testimony. The black lines of the chart break down Bible History and prophesy. 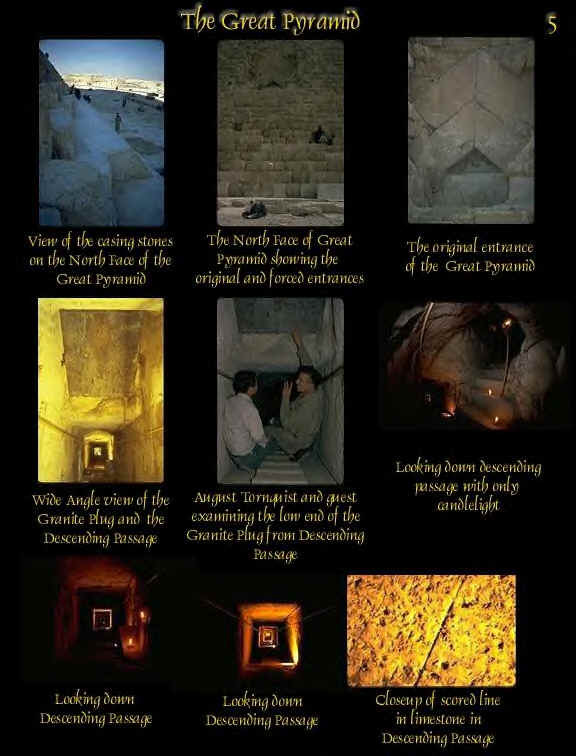 When superimposed over the passage systems of the Great Pyramid, note the amazing correspondences of history with the symbolisms of these passage systems. 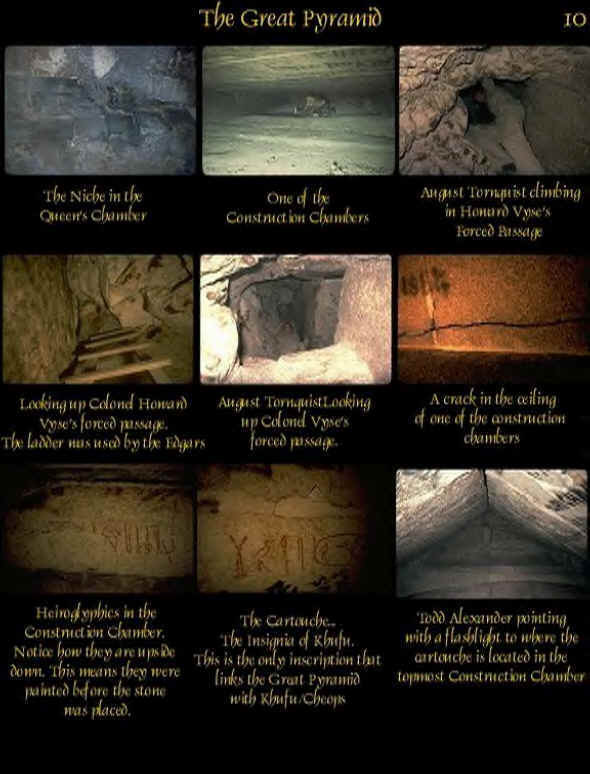 The Egyptian names for these passages (*) provide clues as to the symbolisms intended by the Pyramid’s architect. 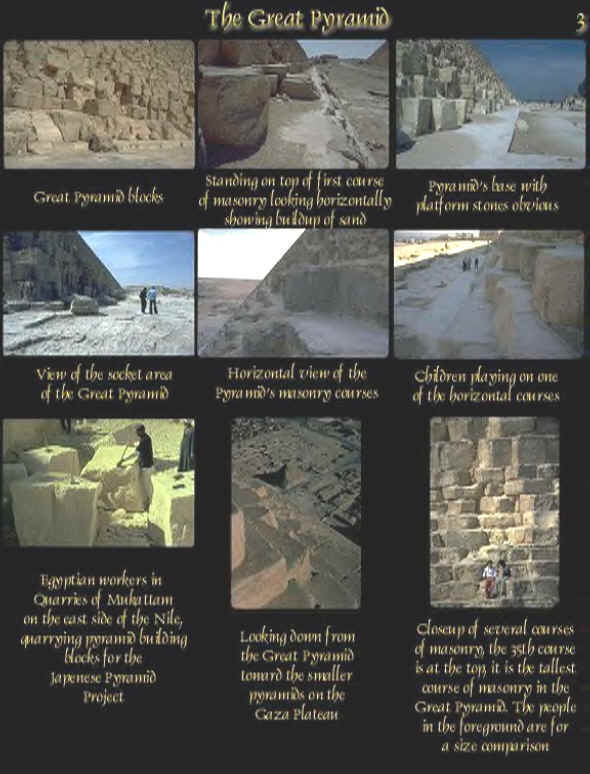 The most important features of God’s plan were carefully written into the blue print of the Great Pyramid. 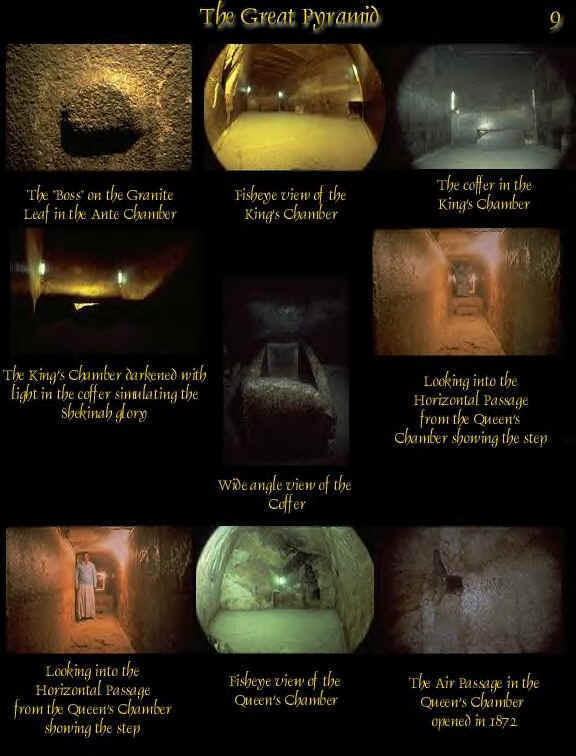 These ages are not arbitrarily drawn, but precise measurements of the chambers and passageways coincide inch by inch (pyramid inch = one year) with man’s history as detailed by the Bible. for further information and pictures. This is the "night of weeping" from which all men groan to be released. (Rom. 8:19, 22; 2 Pet. 3:6-13) There is some righteousness in the world, but evil predominates. Symbolizing that life will be provided for all men on earth (see Queen’s Chamber) and faithful followers of Christ in heaven (see King’s Chamber). 28 feet high, 155 feet long, but only 6 feet wide. 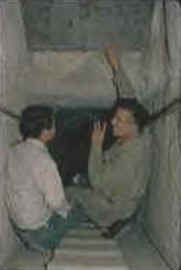 Its steep, narrow, but vaulted climb symbolizes the privileges and difficulties of the "narrow way to life" which Christ’s faithful followers walk at the present time and throughout the Christian Age. 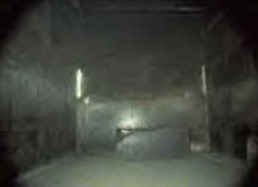 It leads to the King’s Chamber, which represents heaven. 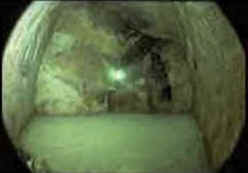 Only the Great Pyramid has ascending passages, making it unique among any of the other pyramids. 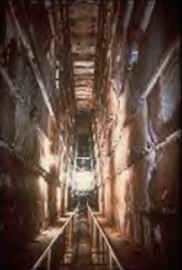 The first of the Great Pyramid’s upward passages represents the promise of life given to all Jews who could keep the law. It is blocked at its lower end by an immovable 50-ton granite plug. 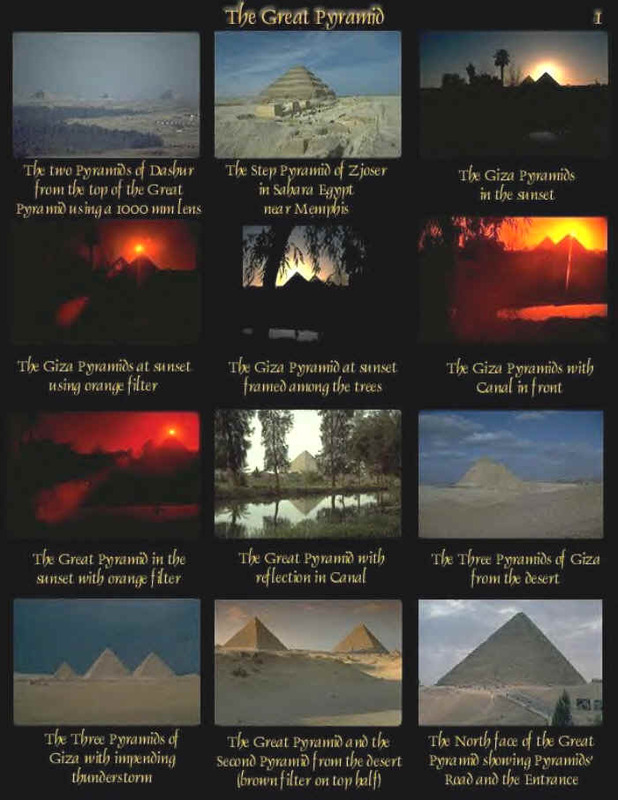 Granite in the Great Pyramid symbolizes that which is divine. Thus, the granite plug demonstrates that none could gain life during the Jewish age because none could keep the perfect requirements of the divine law. 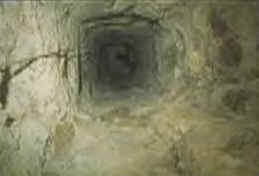 A slippery, downhill passage, Jesus called it the "Broad Way" to destruction. (Matt. 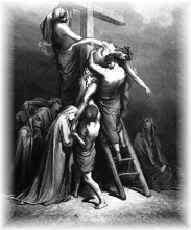 7:13) All men have traveled this path toward death, but all men will gain a complete opportunity for life through Christ in the resurrection. toward steel gate 300' away. Looking down Descending Passage with candlelight. 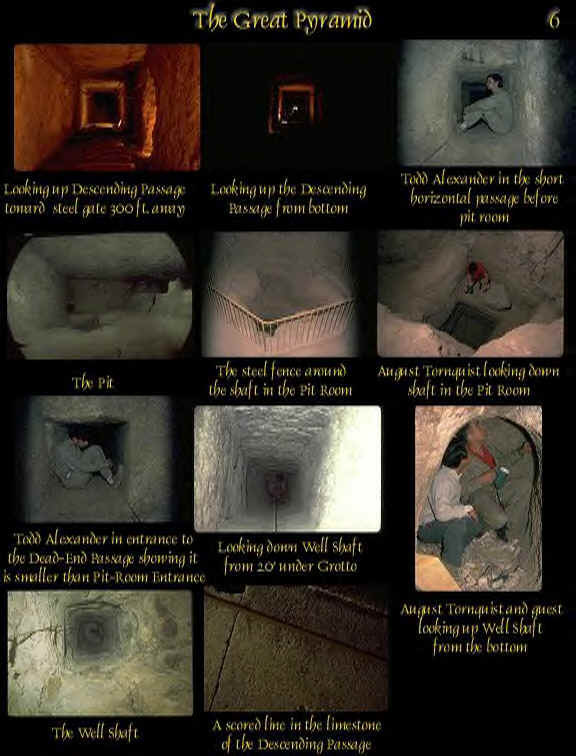 Not really a well, but a way of escape from death to life for those in the lower reaches of the Pyramid. It symbolizes Christ, whose death as a ransom sacrifice will provide a sway of escape for all–even those in the "pit" of death. The Coffer in the King's Chamber. 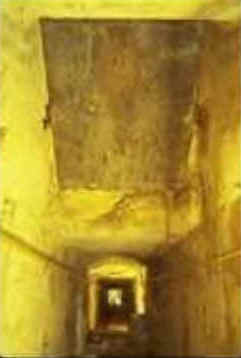 Looking into the Horizontal Passage from Queen's Chamber showing the Step. 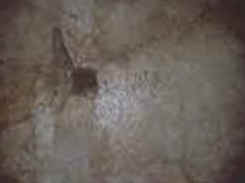 A "Witness Pointing to Jesus"
In the Scriptures, Christ Jesus is likened to the head cornerstone of a pyramid. 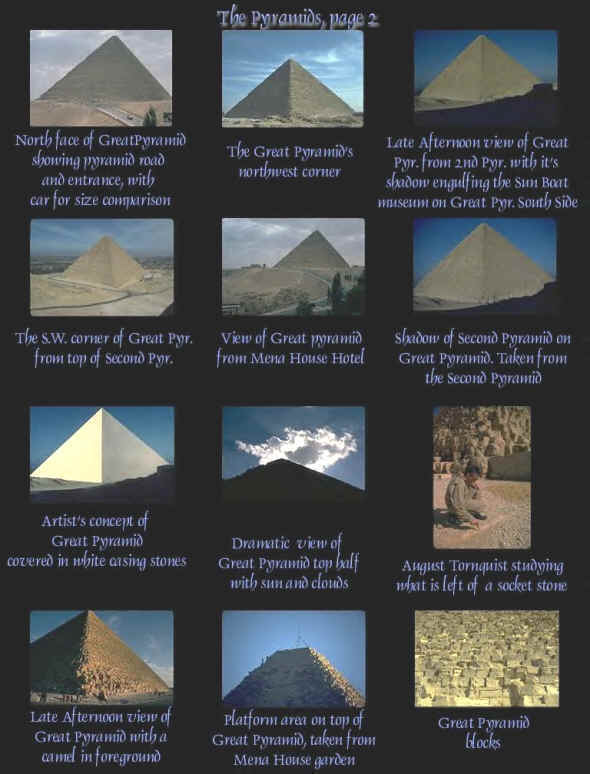 Usually, the cornerstone is at the base of a building, however, with a pyramid, the cornerstone is the top stone, and all other stones must conform to it, so that the final structure itself looks exactly like the top-stone. 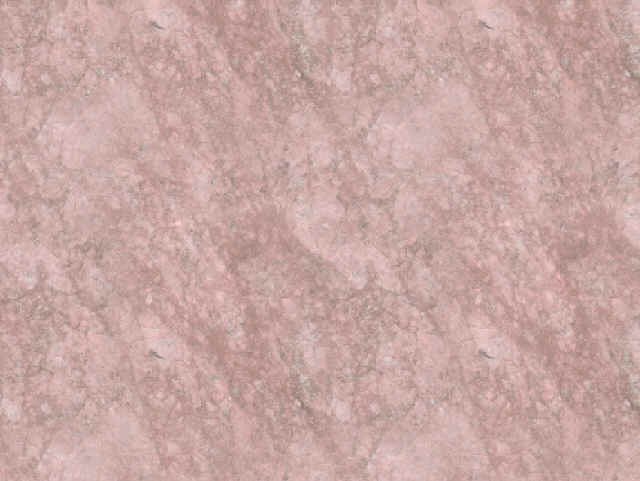 A pyramid is the only structure which offers this unique feature. The crowning feature of God’s Kingdom fulfilled will be Christ, the acknowledged Head over all–its top stone. 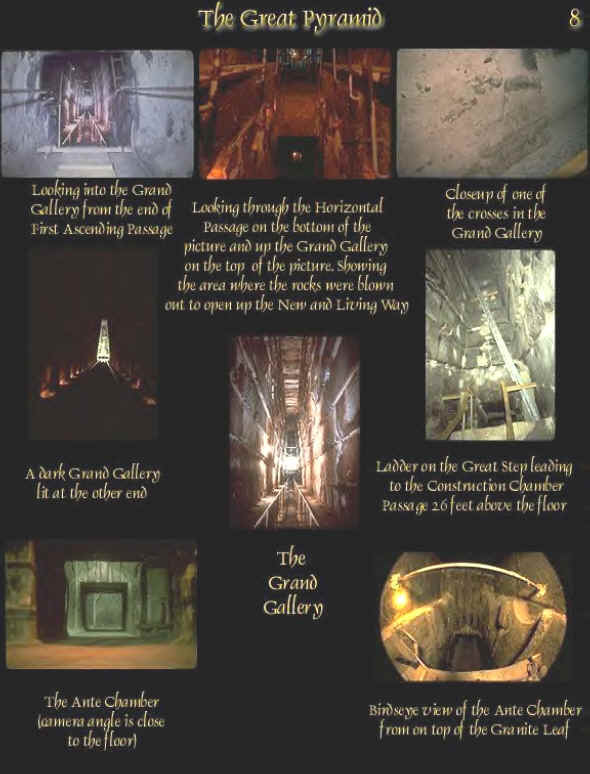 Each symbolic stone will be fitly framed into the glorious building. That it does represent Christ is indicated, not only by its exact fitness as a symbol of Christ, but also by numerous references to the symbol by prophets, apostles and by our Lord Jesus himself. Our Lord applied this very prophecy to himself, showing that he was the rejected stone, and that Israel rejected him, under the leadership of their priests and Pharisees. Matt. 21:42-44; Acts 4:11) This is especially appropriate, because the Great Pyramid has no top-stone, nor has one ever been found. Photo Gallery Courtesy of Todd N. Alexander and S. G. Gowryluk. Click on picture to go back to Ransom Chapter.